Destinations at which the musician still makes his own music, at which a humming spring reverb is still a matter of good taste, at which sound still is created from the ground up and at which fantasy and technical skills still count. Love at first sight and sound – my first encounter with this instrument. I ran into the Polymath for the first time in the spring of 2015, in the holy studio halls of a fellow musician from Cologne / Germany. A few quick notes with the built-in sequencer and this Analogue Solutions’ instrument found itself on my imaginary “synth’s BIG wish list”. The Polymath had somehow escaped my notice up to then. 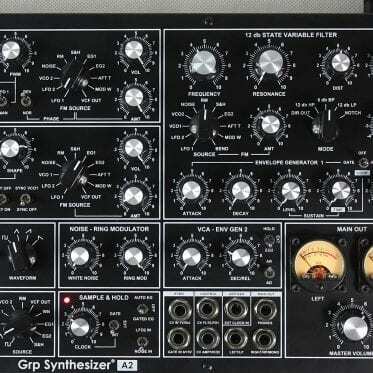 How could I have overlooked this huge and superb analog machine? The Polymath comes in a tremendous cardboard box, the horror of all postmen. There’s a little disappointment in store for you, as the unpacked synthesizer is not nearly as big as that enormous box. What we really miss is a manual (shame, shame). No real problem, of course, since the Polymath User Manual (55 pages) can easily be downloaded from the AS website. Nevertheless, it’s a bit of a surprise that a 4000+ Euros instrument comes without a printed manual. Those 5 or 10 Euros of additional costs wouldn’t even be worth mentioning, they would have guaranteed the important (and very satisfying) “I have everything!” effect when unpacking and checking the just-purchased treasure. Visually, the Polymath is absolutely stunning. Its dimensions (68 x 60 x 23 cm) – and weight (15 kg) mean that this is an impressive piece of musical equipment. 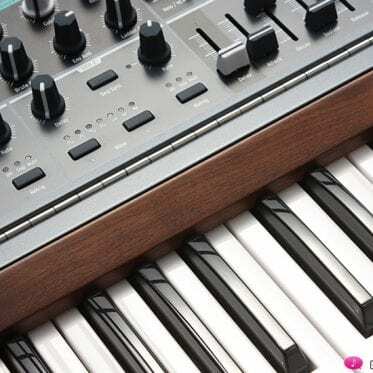 Massive housing, side panels made of precious solid wood, shiny silver pots and a clear optical design with plenty of space and generous lettering are all characteristics of this synthesizer. 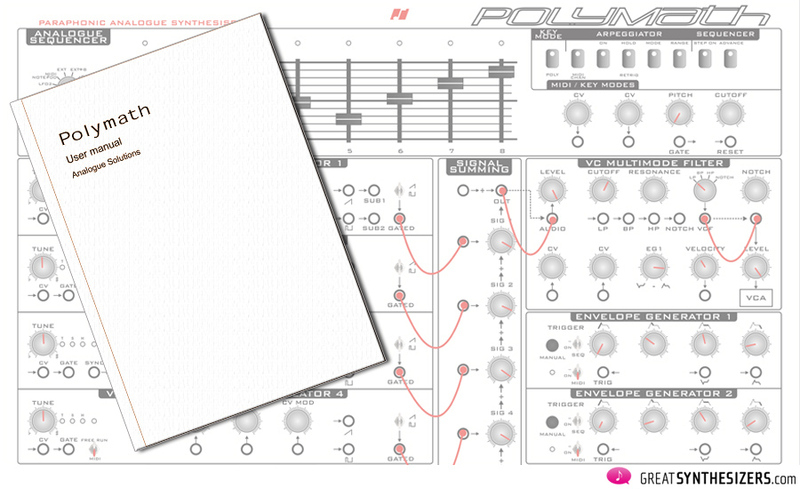 Polymath is a self-contained TRUE analog synthesizer. The voice and modulation circuitry are entirely analog, only using discrete and op-amp components. Impatience is one of man’s biggest downfalls. After unpacking the synth you wanna play immediately! So you turn on the Polymath, connect a MIDI keyboard and a mixer (or headphones), and … oh dear: silence – no sound! A closer look reveals that the Polymath signal path is not wired internally (or just part of it). The mixer comes with no inputs, the VCF needs an audio signal, and using the spring reverb requires additional patching. Otherwise, there is NO sound. All right. After setting up a correctly patched signal path (and after fiddling around with half a dozen cables), you finally hear the first Polymath sounds. This is where the journey begins. A journey to unknown or forgotten places, places we have practically forgotten during the past years / decades. 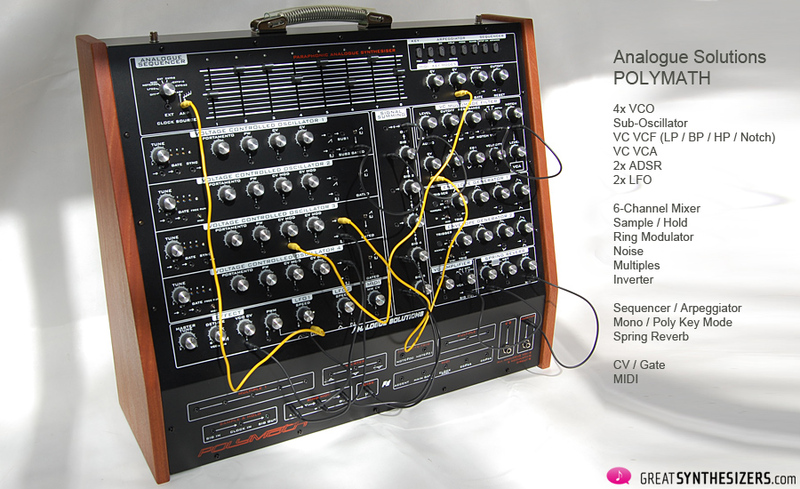 Analogue Solutions itself praises the Polymath as a synth with the “sound of the 70s”. And yes, there is something to that. Such a wild, impetuous sound is hardly to be found on the current synthesizer market. Humming filter sweeps, a slightly roaring signal path, crackling envelopes, trembling speakers … the Polymath breaks all chains! We greatly appreciate the multimode VCF – it is superb! Filter resonance is so beautiful! Screaming, dangerous, colorful! 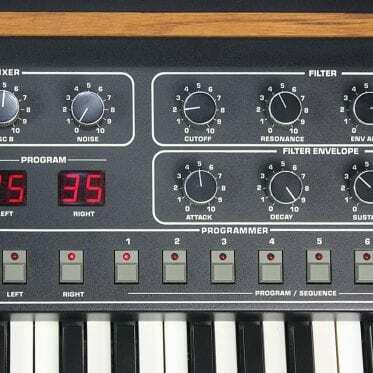 And the notch mode is especially worth mentioning, a wild filter that comes close to the power of the Oberheim SEM VCF. Then there’s a step sequencer and spring reverb. 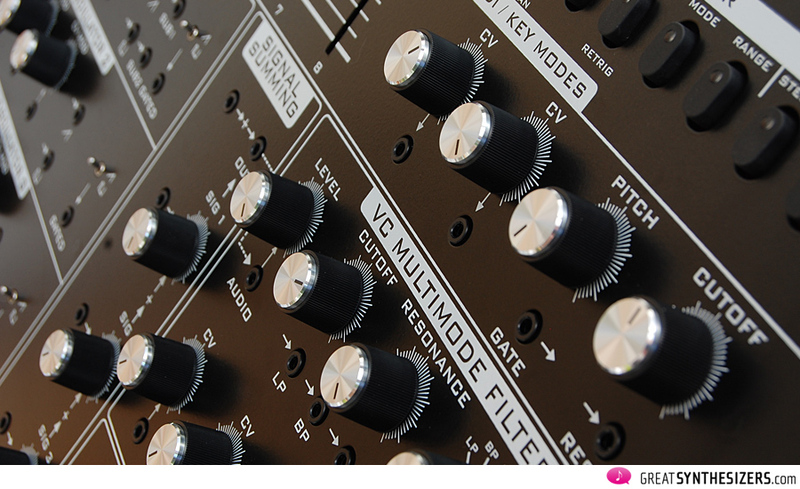 Both modules enhance the instrument’s vintage touch. All in all the Polymath is an impressive synthesizer with the sound, touch and feeling of the 70s at its best! First of all: there’s no complete pre-wiring of the signal path (as already mentioned). And you can’t find the octave switches for the VCOs. Because there aren’t any! What to do? Route a control voltage of the (static!) 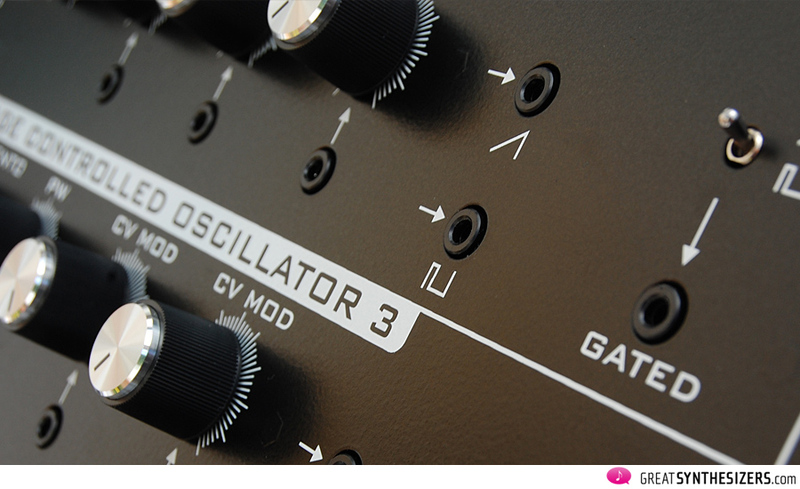 sequencer to the oscillator pitch modulation … and craft your own octave settings! 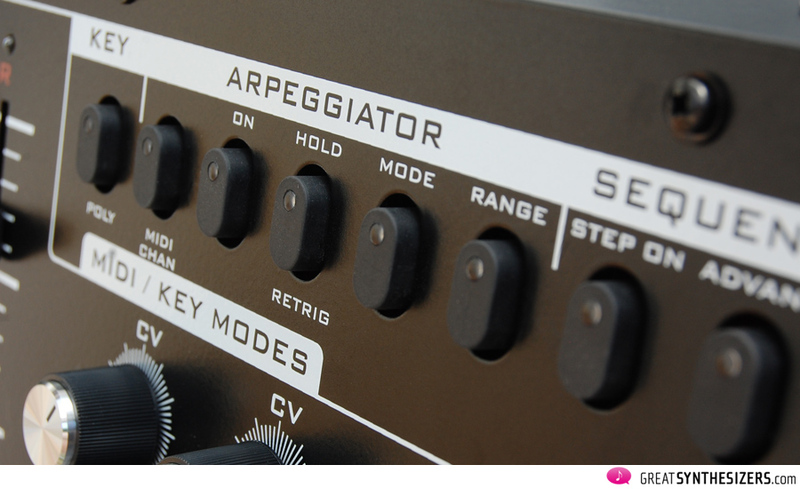 Finally, the arpeggiator should come to life. But with the sequencer knob switched to ARP setting, nothing happens. Absolutely nothing. “Connect a clock signal first!” is the Golden Polymath Rule. 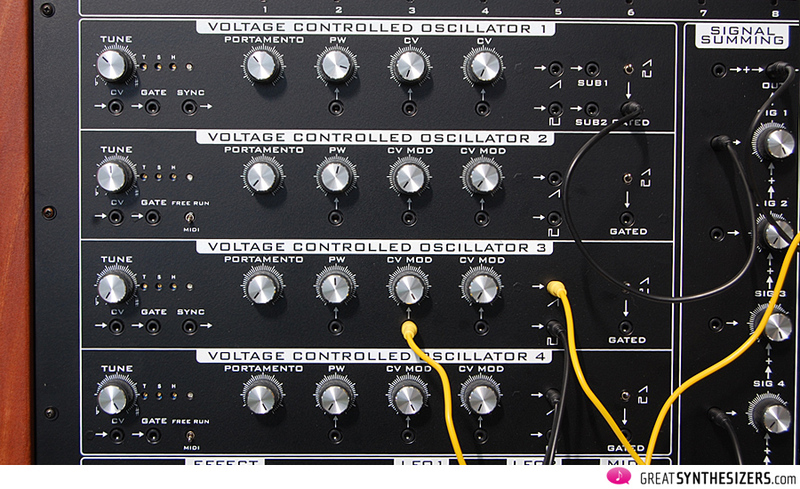 They come in a 4-pack: the oscillators. And, indirectly, they give the instrument its name: Polymath. Because in poly mode the sound jumps from one VCO to the next. 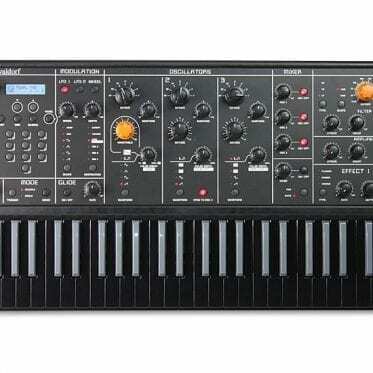 As in days gone by the Korg Mono / Poly. The VCOs have almost identical structures. A glance at the graphic should be enough explanation of the oscillators. Worth noting: Each VCO has its own portamento time. And VCO 2 as well as VCO 4 can be used for modulation purposes (FREE RUN). Excellent. What can I say? The VCF is noble. Not always easy to handle (caution: snappy resonance) and no mainstream junk. 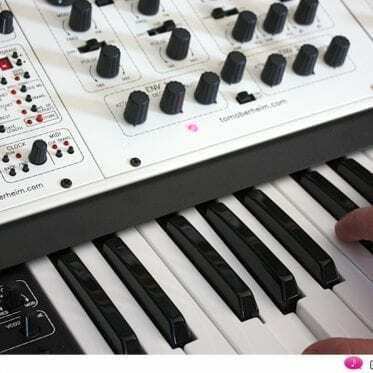 It reminds us in fact of the Oberheim SEM filter (well, ok, a littlebit mainstream), but behaving on its own. Now it would not be the Polymath if that was the whole story. You do need to route an audio signal through the filter and then the filter to the VCA (just follow the dotted lines). Happy patching! On a closer look, the VCF section has 2 CV inputs. 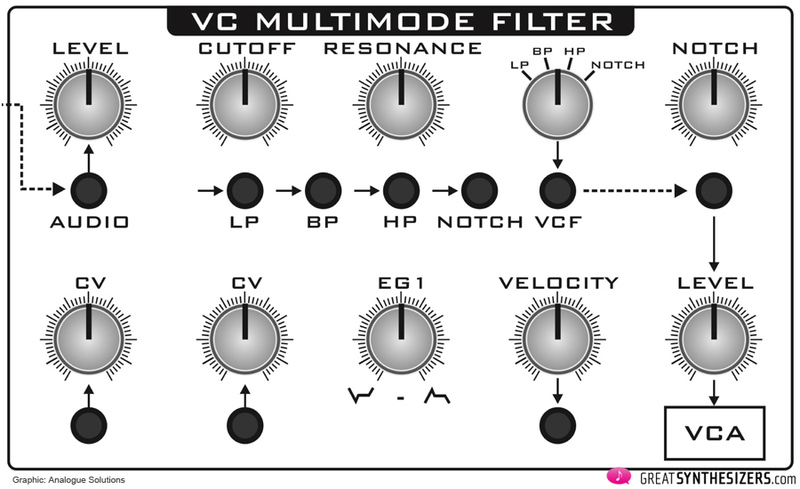 VCF envelope can be adjusted positively or negatively and velocity (from the MIDI interface) is available, too. In a classic double: the envelopes. Twice ADSR, well-known to us. 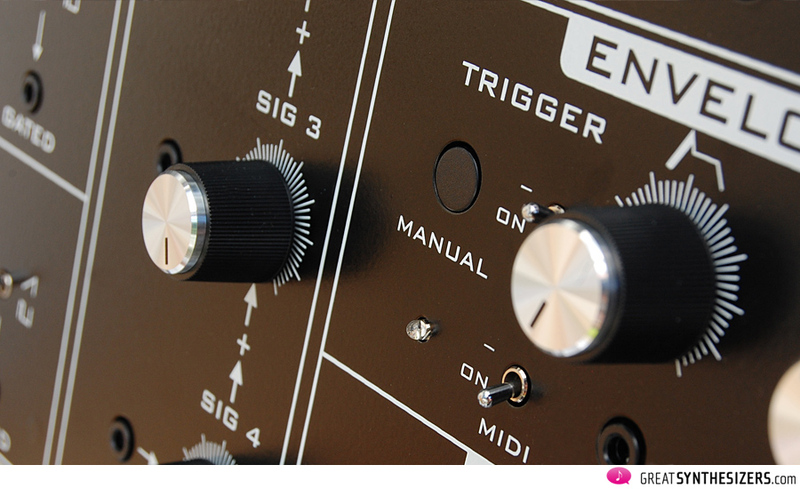 The trigger options are flexible: (internal) sequencer, MIDI, external trigger signal (from a modular system or other step sequencers) and “manual” trigger. Each envelope can be patched positively or negatively (for special autobend effects on the VCOs, etc). The amplifier concept is pleasantly satisfying. It’s a simple VCA, which can be optionally controlled by ENV 1, ENV 2 or GATE or remain in a hold mode in THRU position. Period. In addition, there is a CV input, too. Small and beautiful, that VCA. 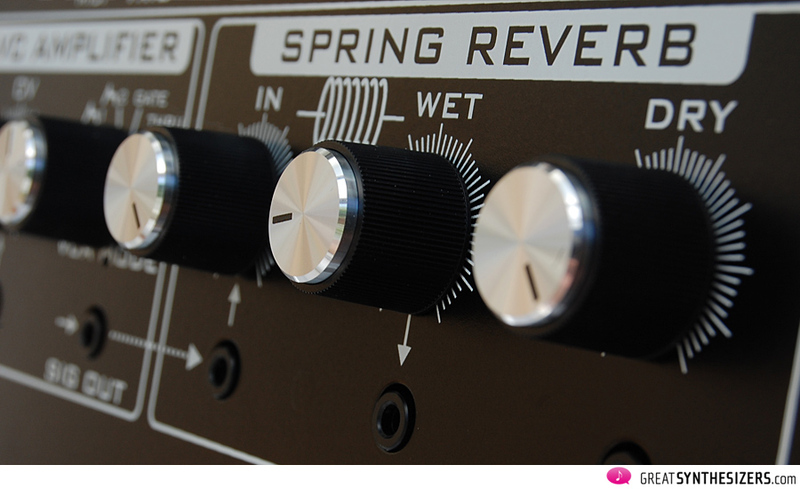 From it, the signal goes to the mixing console or – as an option – through the spring reverb. The latter offers controls for input (IN), reverb (WET) and “dry” signals (DRY). Even the sequencer is designed for the purist. 8 faders (= 8 steps) … and … you’re done! Simple and pleasant. And the faders are extra long (very handy). The sequencer is internally routed to the oscillators (PITCH) and to the filter (FREQUENCY). 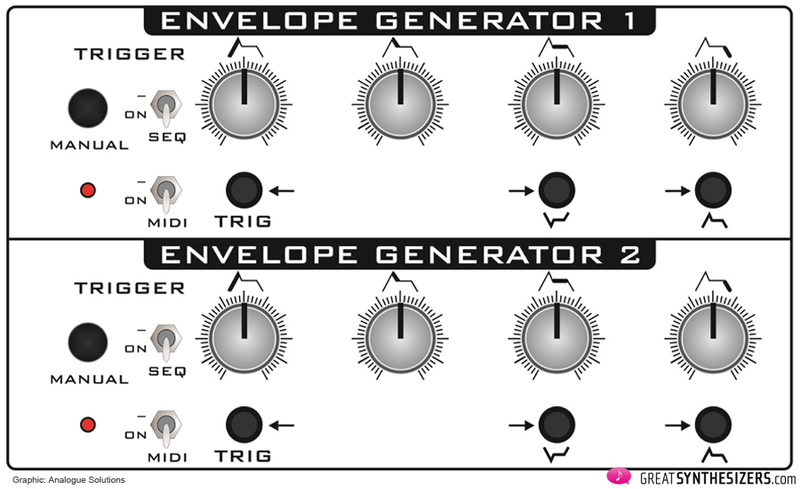 And both envelopes can be switched to SEQ (trigger) mode. So, no extra patch cables needed for basic sequencer operation. 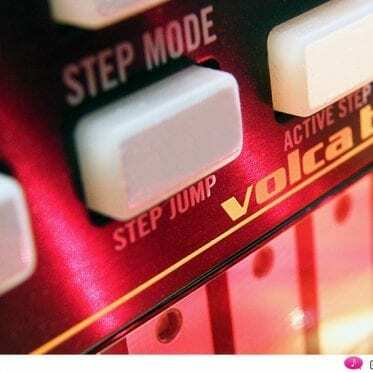 At first glance, it’s not obvious that the step sequencer also offers a separate trigger sequencer. Tapping the STEP ON button activates / deactivates the individual steps. Good for rhythmic variations. But it can hardly be done in realtime (while the pattern is running), so it’s best to stop the sequencer when setting the steps’ gates on or off. What makes the whole section so wonderful is that the modules run in parallel … play the arpeggiator and use the sequencer at the same time for filter modulation. – DETUNE: DETUNE is used to ‘fatten’ the sound when all four VCOs are used – typically in unison (mono mode). 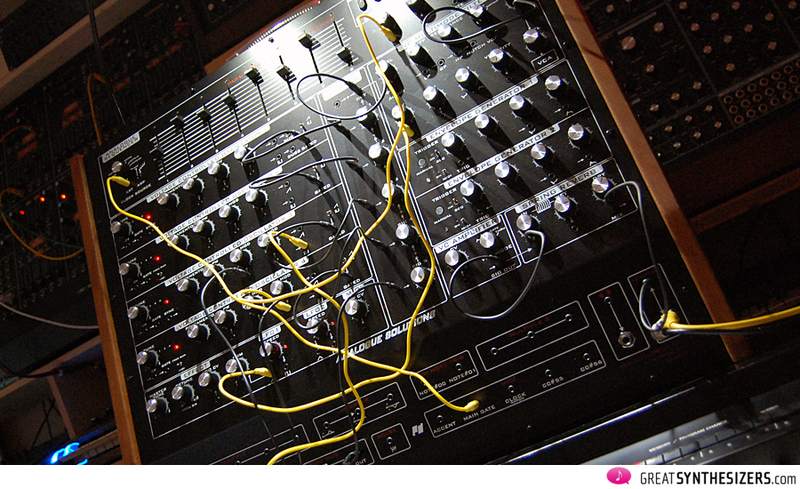 In poly mode the detuned oscillators produce what we call the “Jupiter-4” effect (some voices are in tune, some not) – resulting in an organic, human analog sound. 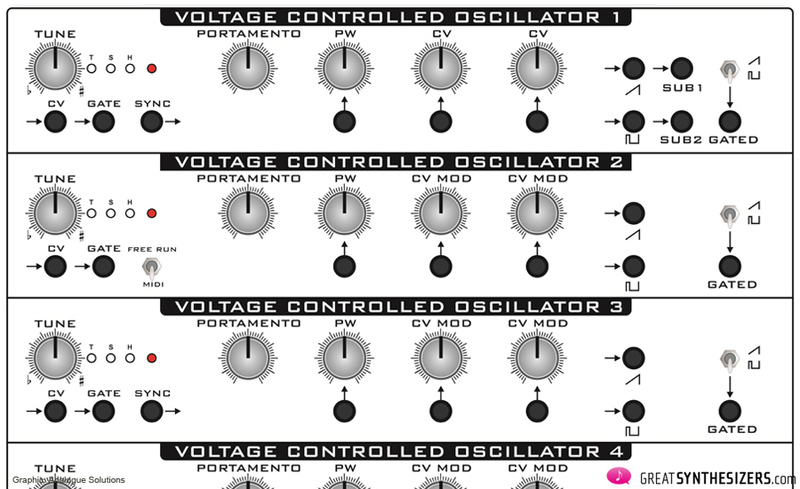 – VCO CV: This modulation input globally affects all four VCOs. It’s an additional pitch control, independent of each VCO’s doubled CV modulation sources. – PWM: This is a modulation CV control input that globally affects all four VCO square wave pulse widths. The knob is bi-polar. Left turn, the signal fed into the socket is used to modulate pulse width. Right turn, LFO 1 serves as modulation source. – Sample & Hold: DIY! Patch the required signals and off you go! White noise is right next to S/H, so stepped random voltages can be achieved in a matter of seconds. – Ring Modulator: DIY! A IN + B IN = OUT. Simple and functional. – Inverter: Very useful. This module will invert any control voltage fed into it. There are one signal input, and two inverted outputs. 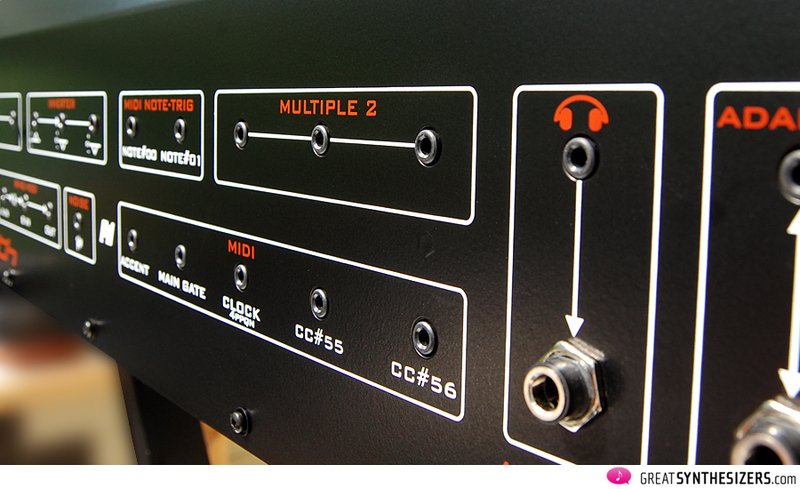 – Multiples: Essential in any modular environment. Polymath offers 2 multiples (1×3 / 1×5). – MIDI NOTE TRIG: MIDI Note Trig 00 and 01 are used for triggering EGs or to clock (or reset) the sequencer, for example. The notes share the same MIDI channel as the rest of the synth. These 2 MIDI notes will not affect pitch. By the way, MIDI Note #00 is C0, MIDI Note #01 is C#0, by the way. MIDI Note #00: This is a gate voltage that is produced each time MIDI note 00 is received. 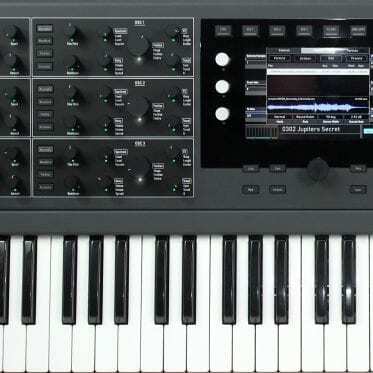 This is also prepatched to the Sequencer Clock Source switch, so the sequencer can be clocked using MIDI note 00 – a far more versatile method than using MIDI Sync. 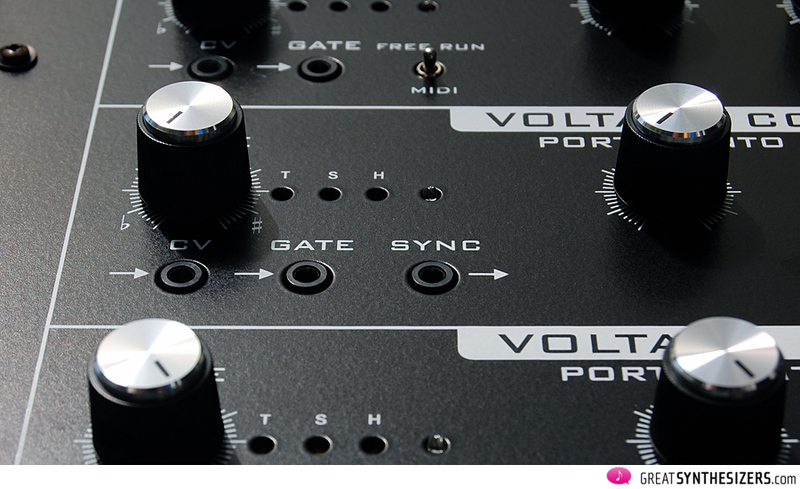 MIDI Note #01: This is a gate voltage that is produced each time MIDI note 01 is received. This could, for example, be patched to the Sequencer’s RESET input, so the sequencer can be programmed to reset using MIDI Note 01. – MIDI: There are additional CV/Signals from the MIDI converter that can be patched back into the synth. 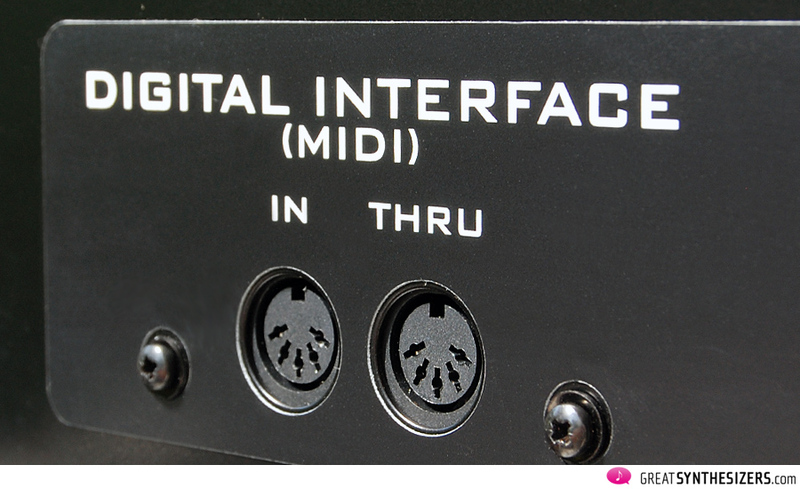 ACCENT: Each time a MIDI note with velocity over 80 is received, this socket will output a trigger. MAIN Gate: This is the main Gate signal of the converter – the one that ordinarily controls the paraphonic gating. It will turn on whenever a MIDI key is held down. CLOCK: MIDI Clock – speaks for itself. CC #55 and CC #56: Additional CV outputs controlled by MIDI controller number 55 and 56. – Headphones: an important, little extra, allowing you to play the Polymath without powering up the whole studio. Listen carefully and do some thinking on your own! The rewards for all those efforts will be spectacular. – Fantastic sounds. Not infinitely flexible (who knows where you’d find that), but very strong and full of character! Highlights: The 4 VCOs and enormously colorful filters. – It hums a little. A good sign? Yes. Here a real VCA is working, here the reverb breaths a little. Noises and hums are a necessary part of analog! – Flexibility. Patching all primary and secondary modules is sometimes annoying, but it allows for totally flexible performances, not only with the Polymath, but (very important) in conjunction with MIDI and / or other synthesizers / modular systems. – Lavishness. In these days of small (and yet amazingly powerful) table synthesizers, it’s an absolute (!) delight to work on a massive instrument like the Polymath. Large lettering, clear layout and the two LED lamps provide excellent working comfort. – Design. The Polymath is pure visual elegance. High quality wooden side panels, shiny pots, tasteful LEDs, noble gooseneck lights. The Polymath charisma is enormous (and fosters a devotion to the instrument). – No octave switches in the VCO section. Pitches can, however, be adjusted by the sequencer voltages over a range of 5 octaves. A little complicated, but at the same time offering musical freedom. 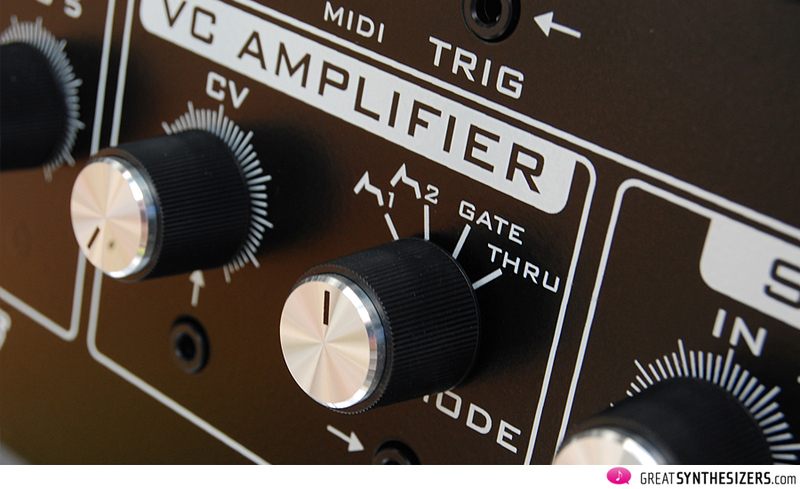 – The VCF can not go into self-resonance. So it is not possible to use the filter as a separate sound source. 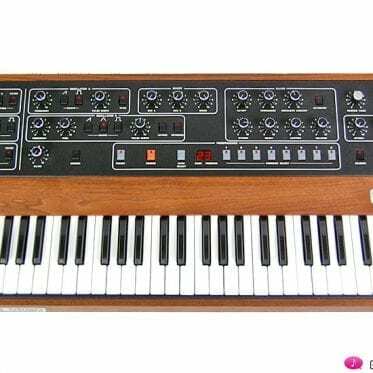 Memories of the Oberheim SEM filter – that classical filter is also not capable of self-resonance. – Mixer without CV controls. Well, a dedicated modulation control for each channel would be the icing on the cake! But the channels can only be manually controlled. – Faders and especially the pots look great, but jiggle a little. And the small patch sockets are not screwed to the housing (patch a cable in MIX out, e.g., and the DRY pot above moves too!). And a silver or white border around the sockets would have been a visual help. In dim studio lighting you could end up patching blindly (“bull’s eye!”) because you can not accurately make out the sockets. Now, these few objections certainly don’t belong in the foreground. Aside from a couple of inconveniences (like the missing octave switches), there are plenty of unusual features that are definitely superior. The Polymath is a fantastic instrument. A real tool for real musicians. An instrument offering the sound (and charm) of the 70’s! We congratulate Tom Carpenter on this luxurious synthesizer. If we may pester just a little (we don’t want all this praise to go to his head), those patching jacks ought to be visually refined (and tightened)! Working with the Polymath will inspire you to be your creative and musical best. We’ve appended a total of 50 minutes of audio files. 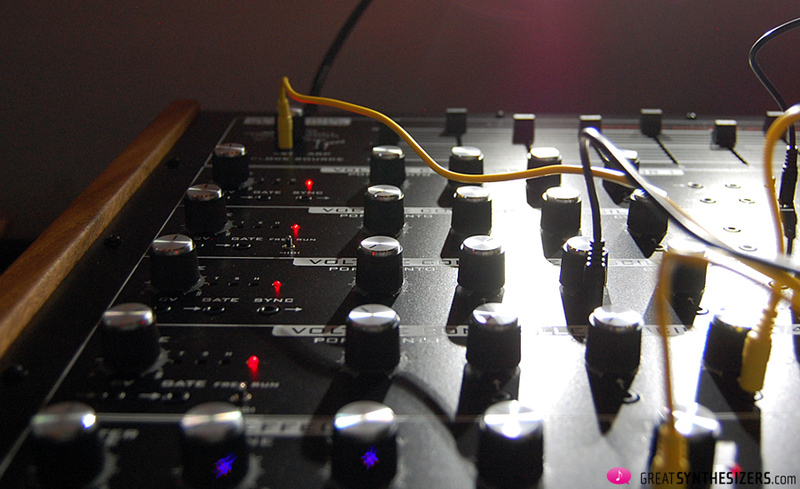 Especially recommended: “Notch 2” – in our opinion one of the most beautiful Polymath sounds. 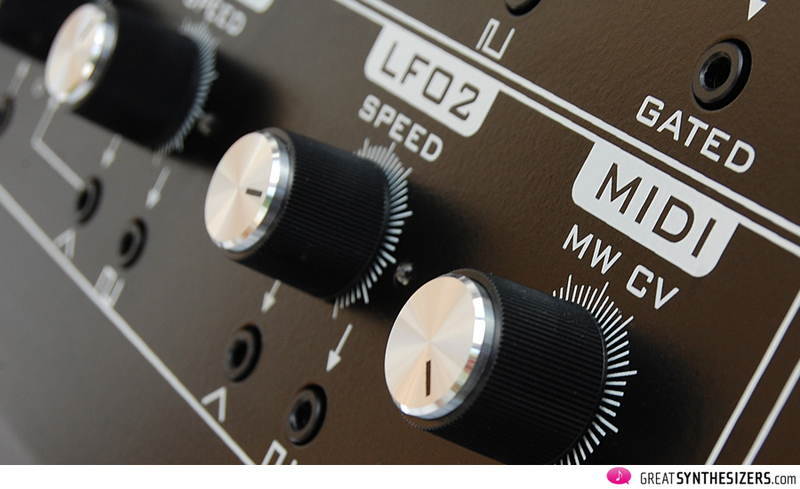 “Sawtooth” is also highly recommended – a powerful analog sound par excellence! Wonderful sounding machine and great demos as always! 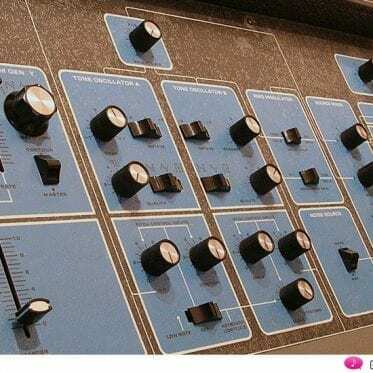 As a proud owner of a Telemark and Leipzig, I can hear something that might be called as signature sound in Analogue Soulutions line. Althought filters are different, there is always some bright and silky musical phasing of the oscillators. Great demos as always. Do you multi-track your demos or is it all one instrument live? 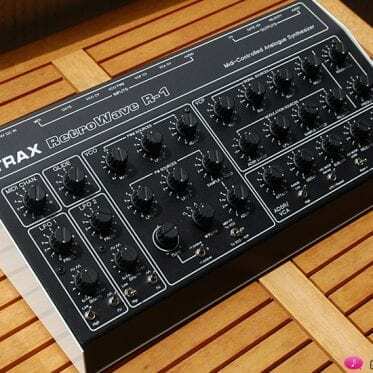 Previous PostKomplex Sequencer – pre-orders opened!